Brew Facts: Recycled from last year! Founders cave-ages KBS (you can taste the stalactites) in bourbon barrels for an entire year. There is also a variation of KBS, called CBS (Canadian Breakfast Stout), which I reviewed here. CBS is made in a similar fashion, but it is barrel-aged in a barrel that recently had maple syrup in it. CBS was a rare bird to find during its original release in 2011, but has reappeared due to a 2015 reissue along with Blushing Monk. 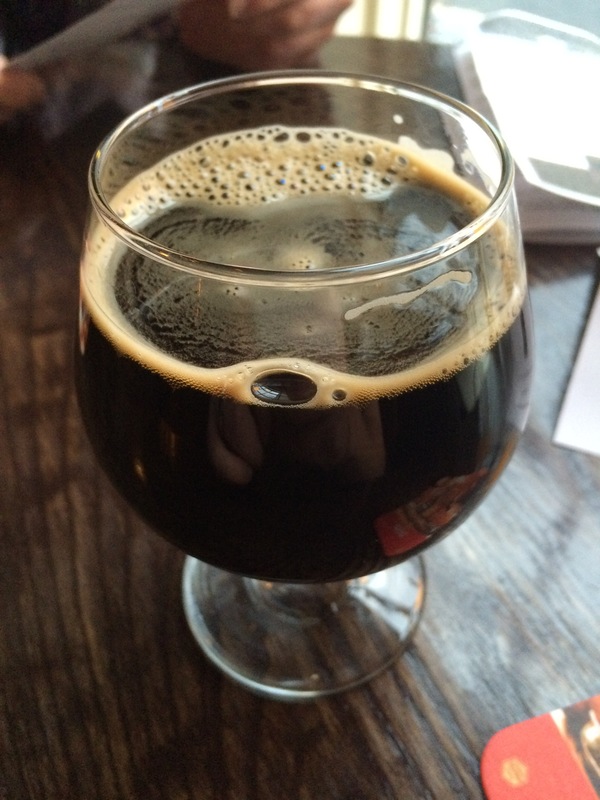 Appearance: The pour is as expected, an inky black stout with a mahogany/cocoa colored head. The creamy foam is made from a mixture of tiny and big bubbles that pile up on the glass edges like bodies in World War Z. Maybe not as viscous black as Ten FIDY, but light is drawn in with no hope of escape. Yes, I’m saying this is light murdering motor oil. A swirl coats the glass in sheets of creamy bubbles that look like they are from a nitro pour. A completely expected and fine looking beer, same as last year. Dark beer is dark. Aroma: A sniff and I find a familiar aroma along with the first distinction that this is not 2014 KBS. The initial hit is coffee/mocha, chocolate (I detect some mint along with the choco, but I may be imagining it), boozy bourbon and indistinct sugariness (perhaps vanilla). As it warms, the aroma turns to a creamy espresso with highlights of tobacco and black licorice. Not quite full on leather, but this year’s KBS is full Russian Imperial/coffee with less emphasize on the sweet and barrel elements. Taste/Mouth Feel: After letting the cold edge warm off, I sip. It has that thick, full mouth feel I love, but doesn’t quite reach the level of BCBS pancake syrup. For as heavy as it is, the body is surprisingly easy drinking. The aroma translates to a taste that blends the savory Founder’s Imperial Stout with the focused deliciousness of Founder’s Breakfast Stout and a shot of bourbon (sounds like something worth trying). It’s a nice mixture of molasses, dark roasted malts, bitter coffee, smokey tobacco, char and maple, although nowhere near CBS levels. As it further warms, mild coconut slips in along with spicy, tongue-tingling heat. The finish is kind of dry, but mostly lingers with char, bitter cocoa and roast malt. 2015 KBS is a layered beer, but one with notable omissions. On the positive side, the chalky finish I found prevalent in the 2014 KBS is gone, however so is much of the barrel. The barrel char still asserts itself, perhaps too much depending on how burnt you like your stouts, but the vanillin, an element I adore in oak barreled beers, is near non-existence. There doesn’t seem to be the levels of dark sugars and wood that would make this a deeper beer. The taste profile is closer to that aforementioned shot of bourbon than a beer aged on bourbon wood. Final Thoughts: I have much love for Founder’s dark, malty stouts (Imperial and Breakfast are among my favorites every year) as well as a special place in my heart for all oak barreled liquids. KBS should be a homerun of epic proportions, but the result is simply a good beer that I was happy to enjoy on a rather slow Tuesday evening at my favorite local bar with my dad (unlimited pours!). Part of my feelings may come from the rather absurd release games that most bars in my area play. From something as simple as wallet gouging ($15 for a 10oz pour) to unnecessary hoop jumping (can only be bought on draft as part of a flight or a week later in a bottle, unless you are part of the growler club which allows you can buy it a day early, blah, blah, blah). Of course, the actions of the draft pourers shouldn’t be held against the beer or brewery, but Founder’s has marketed and developed a demand that goes beyond the prototypical beer nerd to rile up even craft beer casuals every March/April. The simple fact for me is that there are better beers out there in the exact same category as KBS that feature the vanillin, wood, and earthy blend of sugars/malt that make the barrel beer’s best friend. Maybe I’ve been spoiled by some pretty spectacular BB stouts over the years that shaped my beer tastes. Or, maybe I’m falling victim to what I call the “Heady Topper Effect” (where people are very quick to either be overly dismissive of what is a very popular and perfectly fine beer or buy into the hype and declare it the greatest thing ever brewed). When it comes down to it, I can provide as many justifications as I want, but it doesn’t change that the disappointment is real. A disappointment I wish I didn’t feel for a beer that almost everyone embraces. While I have yet to be blown away by my annual KBS tastings (I’ll never quit you! ), the chances are you already love it or will soon. Recommendation: If the price is right, go get it.